This is common to all vent-free gas log sets, not just Rasmussen Chillbuster or Alterna VF sets. Before purchasing a replacement ODS, please read this article thoroughly - it may save you money and time. b) Burner(s) and/or pilot shuts down after a few minutes of operation. 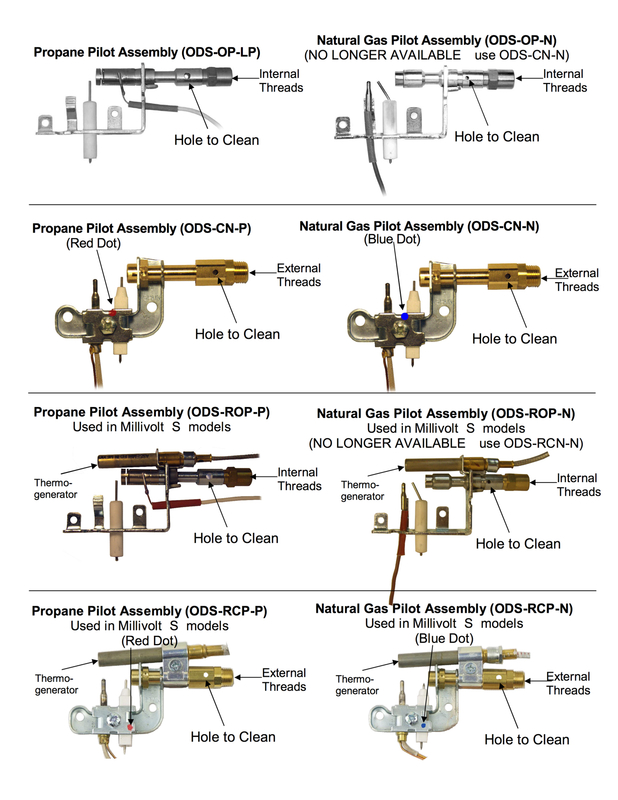 Probable Cause: The ODS Pilot has two small holes that draw in air to mix with the gas to create a stable pilot flame. Unfortunately, over time lint and dust in the air accumulate inside these holes, which disrupts the proper operation of the pilot flame. b) A can of compressed air with a tube (the type that is used to clean computer keyboards) or a drinking straw. 2) Vacuum up all lint, dust & debris from logs, grate, burner(s), burner air intake and air shutter regions (underneath burner, where air gets drawn in), and pilot area. View photo of burners. d) MOST IMPORTANTLY, the air intake holes of the ODS Pilot Assembly. These small air intake holes are between 1/16" and 1/8" in diameter and are located about 2” from the end of the pilot from where the pilot flame originates. Use the compressed air or straw to blow out these holes. Repeat a couple of times. Please note: on units made before 1998, the top hole is covered by a thin metal strip. Slightly lift the metal strip and point tube or straw directly into the hole and blow out several times. Be careful not to permanently bend this strip when accessing the hole). We recommend that you perform this type of maintenance annually before the start of the heating season, more often if the symptoms reoccur. In most cases, replacement of parts is not needed. However, replacement ODS Pilots for Chillbuster sets may be purchased online. Please specify the serial number of your gas log set, as adapter parts may need to be included for older gas log sets. These ODS Pilots may not work with other manufacturer's products due to differences in thread types. I had a can of compressed air for my computer and used it to blow out the hole . It worked!!!!! We got the Chillbuster in 1996 or 1997, in 2010 the nuisance appeared. I read your solution, and got a can of compressed air @ wally world. It's been chill bustin for an hour now, and the nasty nuisance is GONE! our unit has a piezo lighting system (not operated by an electric switch)..can this be lite when electricity goes off using the piezo, and if not, can it be lite with a match? All vent-free sets operate without any outside electricity, other than batteries for remote control units. When lighting the pilot, you may use either the Piezo push button sparker, a match, or aim-n-flame type lighter. This ability to operate without electricity makes our vent-free sets the perfect source of emergency heat in the event of a power outage. Huddle around the fireplace to stay warm when the lights go out.